Last night we celebrated. 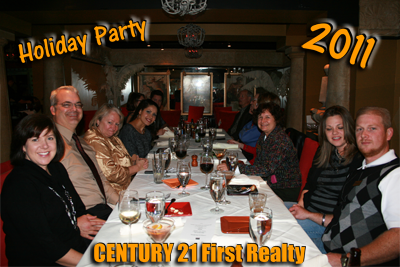 Joe Manausa Real Estate enjoyed it's 2011 year-end holiday party at Andrews 228 in downtown Tallahassee with dinner, drinks, and memories of a wonderful year in a difficult housing market. One of the highlights of the evening involved a game we played called "Name The Agents" and the game board is shown at the right. 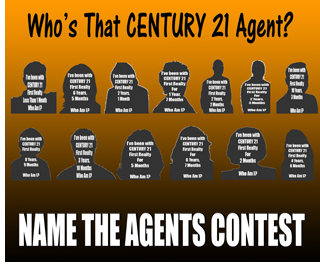 This was blown-up to a poster size image, and party-goers had to correctly identify each of the Joe Manausa Real Estate agents simply by the silhouette and the clue given for each one. The clue was merely the amount of time, in years and months, that each real estate agent had been affiliated with Joe Manausa Real Estate in Tallahassee. From Damian Costantino who has been with use less than 1 month, to Menza Krause who has been a top-producing real estate agent with Joe Manausa Real Estate in Tallahassee for 8 years and 9 months, I thought it would be a difficult challenge for anyone to conquer. But I was wrong. Everybody was able to identify the person silhouetted and it was an interesting to see that at first blush, many people were not immediately drawn to their own profile. But through the hints and process of elimination, they were all able to identify the complete cast of characters. I am very fortunate to be working with the best real estate agents in Tallahassee. With a focus on customer service, these are the hardest working, hardest training Joe Manausa Real Estate agents you will find in the world, and the supportive customer feedback can be found to back this up all over the internet. Their commitment to expertly serving the needs of today's modern real estate consumer, many of whom wish to do so online, has meant a commitment to learning new and changing technologies. They have embraced this challenge and are doing very well. I am proud of this commitment and proud to be associated with such fine people at Joe Manausa Real Estate in Tallahassee.